Pendant is about .5" by .5", on a gold-filled chain with lobster clasp. Please choose 16", 18", or 20" chain. Model is wearing 16" length. 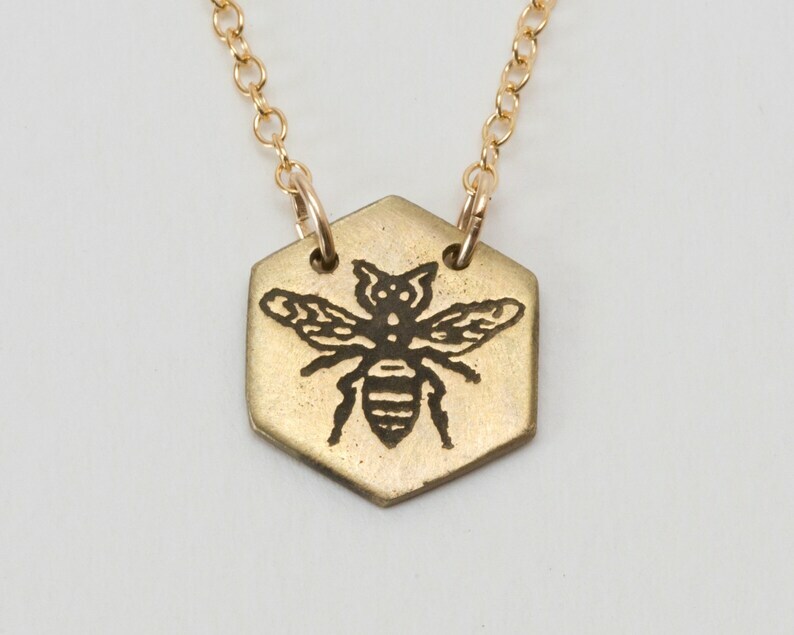 AI etched this classic bee on to an original copper hexagon using ferric chloride and different resists. After cleaning and finishing it, I made a silicone mold so I can now cast this piece in any metal you like! This listing is for a brass hexagon. Each piece is sealed on the back with a clear fixative to prevent oxidation, and also to prevent it from darkening or irritating some people's skin. Would you like a special message on the back? Engraving is available for $14. Please allow 3-6 business days for engraving. You can select the engraving option at checkout, then leave a "note to seller" with the message you would like. You can send any font requests as well. Please remember it's a very small pendant, so it can only fit a word or two. A Christmas gift that my daughter requested. It was shipped right away. The necklace has been made with quality work. She will love it! Thank you! My daughter had lost a necklace like this. I bought her this one to replace it. Very nice quality.